Not all routers allow adjustment of the guide bush. Those with plain fixing holes and nut-and-bolt fixing usually do. With other models, if the bush can’t be centred on the motor spindle, an alternative is to fit the Trend Unibase or Circular Sub-Base. 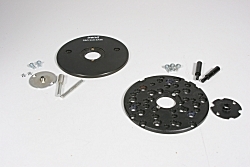 With these, the fixing holes are deliberately drilled oversize for use with pan-headed screws, and the plate comes with an alignment kit. The cone mentioned above is more useful than the alignment pin because it can be used to centre the actual bush to be used, rather than the alignment bush.